In geography, the antipodes (; from Greek: ἀντίποδες, from anti- "opposed" and pous "foot") of any place on Earth is the point on the Earth's surface which is diametrically opposite to it. Two points that are antipodal to each other are connected by a straight line running through the centre of the Earth. In the Northern Hemisphere, "the Antipodes" may be used to refer to Australia and New Zealand, and "Antipodeans" to their inhabitants. Geographically the antipodes of Britain and Ireland are in the Pacific Ocean, south of New Zealand. This gave rise to the name of the Antipodes Islands of New Zealand, which are close to the antipodes of London at about 50° S 179° E. The antipodes of Australia are in the North Atlantic Ocean, while parts of Spain, Portugal, and Morocco are antipodal to New Zealand. Approximately 15% of land territory is antipodal to other land, representing approximately 4.4% of the Earth's surface. 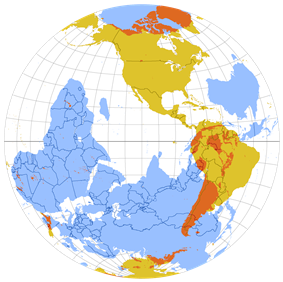 The largest antipodal land masses are the Malay Archipelago, antipodal to the Amazon Basin and adjoining Andean ranges; east China and Mongolia, antipodal to Chile and Argentina; and Greenland and the Canadian Arctic Archipelago, antipodal to East Antarctica. The antipodes of any place on the Earth is the place that is diametrically opposite it, so a line drawn from the one to the other passes through the centre of the Earth and forms a true diameter. For example, the antipodes of New Zealand's lower North Island lies in Spain. Most of the Earth's land surfaces have ocean at their antipodes, this being a consequence of most land being in the land hemisphere. An antipodal point is sometimes called an antipode, a back-formation from the plural antipodes, which in Greek is the plural of the singular antipous. The antipodes of any place on Earth are distant from it by 180° of longitude and as many degrees to the north of the equator as the original is to the south (or vice versa); in other words, the latitudes are numerically equal, but one is north and the other south. The maps shown here are based on this relationship; they show a Lambert azimuthal equal-area projection of the Earth, in yellow, overlaid on which is another map, in blue, shifted horizontally by 180° of longitude and inverted about the equator with respect to latitude. Noon at one place is midnight at the other (ignoring daylight saving time and irregularly shaped time zones) and, with the exception of the tropics, the longest day at one point corresponds to the shortest day at the other, and midwinter at one point coincides with midsummer at the other. Sunrise and sunset do not quite oppose each other at antipodes due to refraction of sunlight. If the geographic coordinates (latitude and longitude) of a point on the Earth's surface are (φ, θ), then the coordinates of the antipodal point are (−φ, θ ± 180°). This relation holds true whether the Earth is approximated as a perfect sphere or as a reference ellipsoid. that is, for the latitude (the North/South coordinate) the magnitude of the angle remains the same but N is changed to S and vice versa, and for the longitude (the East/West coordinate) the angle is replaced by its supplementary angle while E is exchanged for W. For example, the antipodes of the point in China at 37° N 119° E (a few hundred kilometres from Beijing) is the point in Argentina at 37° S 61° W (a few hundred kilometres from Buenos Aires). The term is taken up by Aristotle (De caelo 308a.20), Strabo, Plutarch and Diogenes Laertius, and was adopted into Latin as antipodes. The Latin word changed its sense from the original "under the feet, opposite side" to "those with the feet opposite", i.e. a bahuvrihi referring to hypothetical people living on the opposite side of the Earth. Medieval illustrations imagine them in some way "inverted", with their feet growing out of their heads, pointing upward. Pomponius Mela, the first Roman geographer, asserted that the earth had two habitable zones, a North and South one, but that it would be impossible to get into contact with each other because of the unbearable heat at the equator. The Terrestrial Sphere of Crates of Mallus (c. 150 B.C.). Note the region of the antipodes in the southern half of the western hemisphere. From the time of St Augustine, the Christian church was sceptical of the notion. Augustine asserted that "it is too absurd to say that some men might have set sail from this side and, traversing the immense expanse of ocean, have propagated there a race of human beings descended from that one first man." 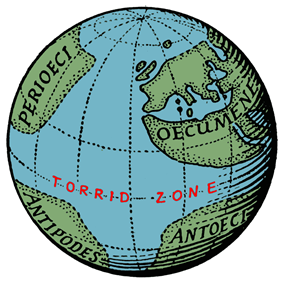 In the Early Middle Ages, Isidore of Seville's widely read encyclopedia presented the term "antipodes" as referring to antichthones (people who lived on the opposite side of the Earth), as well as to a geographical place; these people came to play a role in medieval discussions about the shape of the Earth. In 748, in reply to a letter from Saint Boniface, Pope Zachary declared the belief "that beneath the earth there was another world and other men, another sun and moon" to be heretical. In his letter, Boniface had apparently maintained that Vergilius of Salzburg held such a belief. The antipodes being an attribute of a spherical Earth, some ancient authors used their perceived absurdity as an argument for a flat Earth. However, knowledge of the spherical Earth was widespread during the Middle Ages, only occasionally disputed — the medieval dispute surrounding the antipodes mainly concerned the question whether people could live on the opposite side of the earth: since the torrid clime was considered impassable, it would have been impossible to evangelize them. This posed the problem that Christ told the apostles to evangelize all mankind; with regard to the unreachable antipodes, this would have been impossible. Christ would either have appeared a second time, in the antipodes, or left them damned irredeemable. Such an argument was forwarded by the Spanish theologian Alonso Tostado as late as the 15th century and "St. Augustine doubts" was a response to Columbus's proposal to sail westwards to the Indies. The author of the Norwegian book Konungs Skuggsjá, from around 1250, discusses the existence of antipodes. He notes that (if they exist) they will see the sun in the north in the middle of the day and that they will have opposite seasons of the people living in the Northern Hemisphere. The earliest surviving account by a European who had visited the Southern Hemisphere is that of Marco Polo (who, on his way home in 1292, sailed south of the Malay Peninsula). He noted that it was impossible to see the star Polaris from there. The idea of dry land in the southern climes, the Terra Australis, was introduced by Ptolemy and appears on European maps as an imaginary continent from the 15th century. In spite of having been discovered relatively late by European explorers, Australia was inhabited very early in human history; the ancestors of the Indigenous Australians reached it at least 50,000 years ago. There are no non-stop scheduled flights between any two antipodal locations by commercial airline service—or anything even close. The longest non-stop scheduled flight was the discontinued (as of November 2013) Singapore Airlines Flight 21 between Newark, New Jersey and Singapore, covering 15,343 km (9,534 miles) in about 18.5 hours flight time, and this was far from a journey between nearly-antipodal locations (Madrid and Auckland are 19,590 km apart; Buenos Aires and Beijing are 19,260 km apart; Johannesburg and Honolulu are 19,188 km apart; New York City and Perth are 18,700 km apart). In addition, there is currently no commercial aircraft capable of travelling between antipodes at full load non-stop. (The current record holder Boeing 777-200LR's maximum range is rated at 17,395 km.) While a flight between antipodal locations by non-supersonic travel might present difficulties for passengers, airlines assign relief crewmembers to assume their primary pilot positions for designated portions of long-haul flights, allowing those pilots to rest or sleep. Some cities and towns which are near-antipodes in equirectangular projection. Blue labels pertain to cyan and brown labels pertain to yellow areas. Areas where cyan and yellow overlap (coloured green) are land antipodes. Around 71% of the Earth's surface is covered by oceans, and seven-eighths of the Earth's land is confined to the land hemisphere, so the majority of locations on land do not have land-based antipodes. 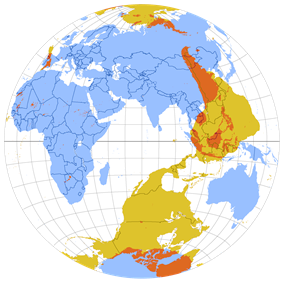 The two largest human inhabited antipodal areas are located in East Asia (mainly eastern China) and South America (mainly northern Argentina and Chile). The Australian mainland is the largest landmass with its antipodes entirely in ocean, although some locations of mainland Australia and Tasmania are close to being antipodes of islands (Bermuda, Azores, Puerto Rico) in the North Atlantic Ocean. The largest landmass with antipodes entirely on land is the island of Borneo, whose antipodes are in the Amazon rainforest. Taiwan (formerly called Formosa) is partly antipodal to the province of Formosa in Argentina. Gibraltar is approximately antipodal to Te Arai Beach about 85 km north of Auckland, New Zealand. This illustrates the old yet correct saying that the sun never sets on the British Empire; the sun still does not set on the Commonwealth of Nations. The northern part of New Caledonia, an overseas territory of France, is antipodal to some thinly populated desert in Mauritania, a part of the former French West Africa. Portions of Suriname, a former Dutch colony, are antipodal to Sulawesi, an Indonesian island spelled Celebes when it was part of the Netherlands East Indies. Luzon Island in the Philippines is antipodal to Eastern Bolivia. As with the British Empire, the sun set neither on the French Empire, the Dutch Empire, nor the Spanish Empire at their peaks. Santa Vitória do Palmar, the most southerly town of more than 10,000 people in Brazil, is antipodal to Jeju Island, the southernmost territory of South Korea. The Big Island of Hawaii is antipodal to the Okavango Delta in Botswana, with the island's largest city, Hilo, antipodal to Nxai Pan National Park. Easter Island is antipodal to Desert National Park, 35 km from Jaisalmer, India. Desolate Kerguelen Island is antipodal to an area of thinly inhabited plains on the border between the Canadian provinces of Alberta and Saskatchewan and the US state of Montana. The Heard Island and McDonald Islands, an uninhabited Australian territory, is antipodal to an area in central Saskatchewan, including the towns of Leask and Shellbrook. St. Paul Island and Amsterdam Island are antipodal to thinly populated parts of the eastern part of the US state of Colorado. Lake Baikal is partially antipodal to the Straits of Magellan. The Russian Antarctic research base Bellingshausen Station is antipodal to a land location in Russian Siberia. Rottnest Island, off the coast of Western Australia, is approximately antipodal to Bermuda. Flores Island, the westernmost island of the Azores, is nearly antipodal to Flinders Island between Tasmania and the Australian mainland. Point Nemo, the point in the South Pacific Ocean most distant from any other land, is precisely opposite a desolate piece of desert in western Kazakhstan. By definition, the North Pole and the South Pole are antipodes. As can be seen on the purple/blue map, the Pacific Ocean is so large that it stretches halfway around the world; parts of the Pacific off the coast of Peru are antipodal to parts of the same ocean off the coast of Southeast Asia. Countries matching up with just one other country are Morocco, Spain, Chad, Libya, Cameroon (with the Cook Islands of New Zealand); Egypt, Eritrea, Ethiopia (with French Polynesia); Senegal (Vanuatu); the UAE (Pitcairn); Ghana, Ivory Coast (Tuvalu); Burkina Faso (Rotuma in Fiji); Guinea (Solomon Islands); India (Easter Island); Laos, Cambodia, Vietnam, and Thailand (all with Peru); Singapore (Ecuador); Brunei, Palau, Micronesia (all with Brazil); Venezuela and Suriname (Indonesia). Of these, the larger countries which are entirely antipodal to land are the Philippines, Malaysia, Taiwan, Fiji, Vanuatu, Brunei, and Samoa. Chile was as well prior to its expansion into the Atacama with the War of the Pacific. New Zealand writer Mark Price undertook a tour in 2005–06 of the length of New Zealand and its land antipodes in Morocco and Spain, from Kerikeri (near Larache and Lixus, Morocco ) to Cathedral Square, Christchurch (near Foz, Spain ). On the popular TV show Angel, the Deeper Well is a hole that goes through the world, with its entrance in the Cotswolds in England and its antipode in New Zealand. The May 19, 2008, official Lost audio podcast gave credence to a theory that the Island (where the show is set) is located at Tunisia's antipode, in the south Pacific east of New Zealand. "The Gathering", a fourth series episode of Torchwood, refers to Shanghai and Buenos Aires as being antipodes of each other. The tenth and final episode notes more precisely that they are "perfect antipodes" while acknowledging that is only accurate "give or take a hundred miles or so." In 2006, Ze Frank challenged viewers of his daily webcast the show with zefrank to create an "Earth sandwich" by simultaneously placing two pieces of bread at antipodal points on the Earth's surface. The challenge was successfully completed by viewers in Spain and New Zealand. ^ Antipodes, Liddell and Scott, "A Greek-English Lexicon", at Perseus. ^ Compact Oxford English Dictionary, 2008, "Antipodes" Access date: 2010-02-21. ^ Plato, Timaeus 63a, translated by Benjamin Jowett, (Indianapolis: Bobbs Merrill, 1949). ^ Relief Crews On Long Haul Flights, Airliners.net, March 18, 2002. Antipodes Map Interactive map which draws a tunnel to the other side of the world. Earth Sandwich Map dual-image map to locate the antipodes of any location on Earth. 3D dual globe schematic 3D representation of the earth and the anti-earth on the same place. Antipodes An online and photographic project which pairs webcam images from places on opposite sides of the globe.